Roland Wilson Browne was born in Leicester in 1895 and registered as Roland Wilson Brown – without the ‘e’ – in the second quarter of 1895 [Leicester, 7a, 244]. His parents were John William Brown[e], a bookseller, born in Hartlepool in about 1865 and Emily Jane née Wheatley, born in Saltburn in about 1866. Their marriage was registered in King’s Norton, Birmingham, in the fourth quarter of 1888. In 1891 they were living in Stockton [on Tees]. Their first son, Archibald Ellmer Browne, was born back in his mother’s home town of Saltburn in about 1892. It seems the family then moved to Leicester, where Roland was born in 1895, and then on to Rugby, where Basil Cleveland Browne was born in about May 1900, being 11 months old for the 1901 census when the family were living at 31 Abbey Street. A sister, Hilda Emily Browne was born in about 1903. By 1911 the family were living at 1 Charlotte Street, Rugby. The eldest brother, Archibald, was a Clerk in 1911 – the two youngest were still at school – and he remained in Rugby. Archibald’s marriage with Alice R Duffin was registered in Rugby in the second quarter of 1921. They had a daughter, Kathleen in later 1924 or early 1925. He died on 20 September 1964. 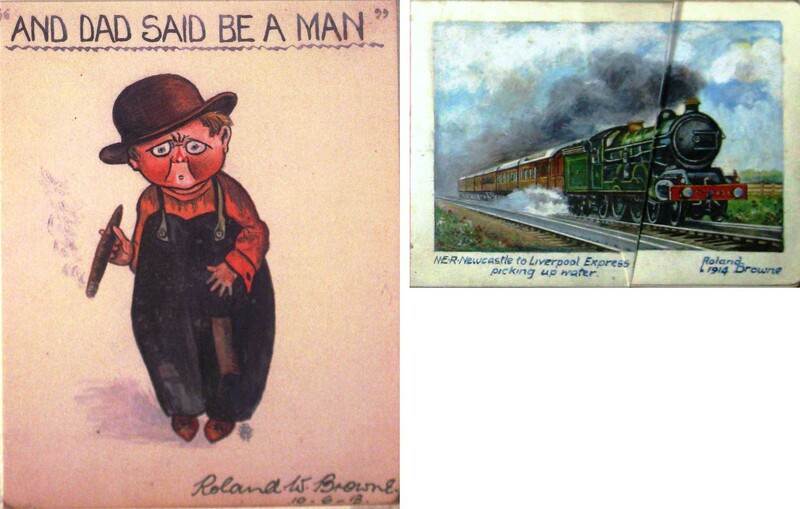 In 1911, Roland was a 15 year old ‘Apprentice in Drawing Office’. He would work in the BTH drawing office until he joined up probably in 1918. Whilst Roland was working at BTH he had a ‘girlfriend’ Rose Whittaker. She had an autograph book which contained contributions from her friends and work colleagues: Roland made several contributions which showed his drafting skills: the examples below date from 10 June 1913 and 1914. It seems likely that Roland did not enlist until later in the war – possibly because his work at BTH would have been considered war related and his skills as a draftsman were necessary for that. His Medal Card only mentions him being in the Manchester Regiment and that he was entitled to the Victory and the British War Medals only: this also suggested a later date of enlistment. The UK, Soldiers Died in the Great War, 1914-1919, records stated that Roland Wilson Browne enlisted at Rugby as No.49342, in the Leicestershire Regiment. Other surviving Service Records for the Leicestershire Regiment suggest that Roland may have enlisted as late as May 1918, probably into the 3rd Battalion. His number 49342 falls between those for Mee: No.48354, and Armiso: No.49963, both of whom enlisted at Leicester on 22 May 1918 into the 3rd Battalion of the Leicesters. This seems to have been a training Battalion, and it was probably why he was later transferred into the 2nd Battalion of the Manchester Regiment with the new Regimental Number 76326. The allocation of these numbers cannot yet be precisely dated but the 75743 and 75985 were allocated at Warrington and Accrington on 29 May and 17 June 1918, so he probably did his basic training and was then posted to an active unit. This would not be incompatible with a contingent of reinforcements which was posted to France and/or Flanders and arrived in the line in August 1918, as suggested by the 2nd Battalion’s War Diaries below. On the 6 February 1918, the 2nd Battalion of the Manchester Regiment had transferred to 96th Brigade, in the 32nd Division. In 1918 they were in action on the Somme; in the Battles of the Hindenburg Line and in the Final Advance in Picardy. The abstracts from the War Diaries below provide some background. September 6th: moved to La Neuville. 28th: moved to Vendrelles, crossing the San Quentin canal on the 29th. 30th: moved to Magny-La-Fosse incurring 20 casualties. October 1st: The batt attacked the enemy system (Hindenberg line) with ‘complete success’ at 4pm with 4 tanks, broke through the Beaurevoir-Fonsomme line after hand to hand fighting, capturing 210 prisoners. There were then subjected to repeated counter attacks during the night but the 2nd Manchesters successfully maintained their position with the assistance of a company of the 15th Lancs Fusiliers (another local pals battalion). 3rd: withdrawn to Lehancourt with nearly a hundred casuaties. 5th: moved to Handcourt, later to Bohain. 30th: moved to Oise Canal for the attack there, patrolling no mans land prior to the battle. November 4th: The battalion attacked on the left flank of the brigade meeting intense shell and machine gun fire across the canal north of Ors. Lt Kirke paddled across the canal on a raft and engaged the enemy with a Lewis gun, (he did not survive but was awarded a posthumous VC) but a bridge was erected and 2 of his platoons crossed but were held by enemy fire and the bridge destroyed. The remaining troops were sent to another crossing which had been secured by the 1st Dorsetshires. They attacked the Germans at La Motte farm and achieved their objectives. The attack continued unabated. The war came to an end on the 11th November but the part the 2nd Battalion played came to an end on the 6th it went into billets at Sambreton where it learnt about the armistice. The village of Ors is to the east of Cambrai between Le Cateau and Landrecies. It was in German hands for much of the First World War but was cleared by the 6th Division on 1 November 1918. The 2nd Manchester Battalion were part of the 17th Brigade within the Division and, as noted above, the further actions to cross the Oise Canal followed on 4 November. More details of the action on 4 November 1918 are given below, as the 2nd Battalion included among its officers, the poet, Wilfred Owen. … on 4th November 1918 at 5.50 a.m., Wilfred Owen and his ‘D’ Company of the 2nd Bn. Manchester Regiment, lined the bank ready to attempt a crossing of the canal and then to attack the Germans holding the opposite bank (attacking left to right on the photograph – above). Their objective was in the region of La Motte farm. The Manchesters’ ‘C’ Company was in position to Owen’s right hand as he faced the far bank and next to them and holding the canal bank and the village of Ors with its canal lock and broken bridge, was the 1st Bn. Dorsetshire Regiment. … the 206th and 218th Field Companies of the Royal Engineers together with men from the Division’s Pioneer battalion, … was to construct rafts, pontoons and bridges … so that the attackers could first negotiate the wide and deep ditches beside the canal and then get across the canal itself to form a bridgehead on the far bank. … the Manchesters and the Lancashire Fusiliers north of the [Ors] lock were taking heavy casualties and … their attempts to cross the canal there were not going to succeed. Orders were given for both these battalions to make their way through Ors village and then to cross the canal by the floating bridge set up by the 206th Field Company R.E. just south of the lock. By 8.30a.m. they were on the other side of the canal and in action. 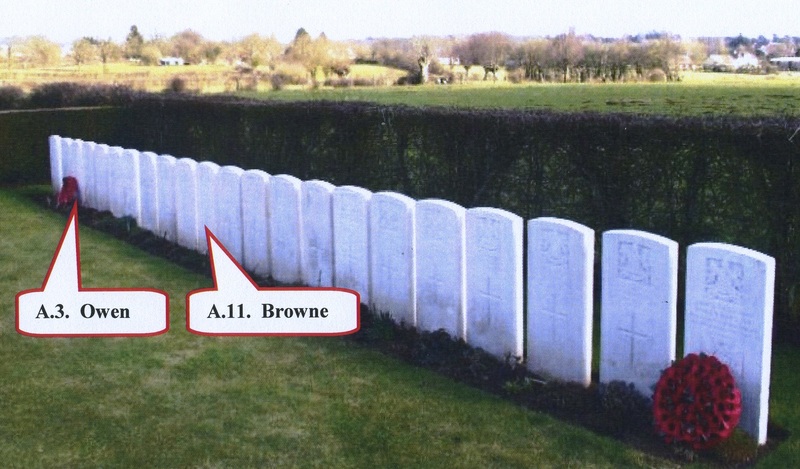 It was during these attacks, and the failed attempts to cross the canal north of Ors on 4 November 1918 that Private Roland Browne, aged 23, and Lieutenant Wilfred Owen M.C., aged 25, were both killed in action. They are both buried in the Ors Communal Cemetery (above): Roland in Grave: A.11., and Wilfred in Grave: A.3. The village Communal Cemetery is north-west of the village and over sixty WWI casualties are commemorated there. The great majority were killed in action on 4 November 1918 and were men from the 2nd Battalion Manchester Regiment or the Lancashire Fusiliers. There is another cemetery, the Ors British Cemetery, about a kilometre north-east of the village. It was begun in November 1918 and the number of Highland Light Infantry and Royal Engineers graves result from their efforts to cross the canal near the cemetery on 4 November 1918 and the preparatory work on 3 November 1918. Today there is a Wilfred Owen Centre in Ors run by the Wilfred Owen France Association – sadly Roland Wilson Browne is not so well remembered. Perhaps this project will help us to remember him, if only by this coincidental association. This article on Roland Browne was researched and written for the Rugby Family History Group [RFHG] project, by John P H Frearson and is © John P H Frearson and the RFHG, May 2015. Thanks to Wendy Farthing at the Rugby Art Gallery and Museum for alerting the author to the illustrations from Rose Whittaker’s autograph album and giving permission for their use. It was displayed at Rugby Museum in September 2014, in a temporary exhibition relating to the 1914-1918 war. This may have been when Roland Browne joined the Manchesters on active service. Wilfred Owen M.C. was the son of Mr. and Mrs. Tom Owen, of “Mahim”, Monkmoor Road, Shrewsbury and a native of Oswestry. He enlisted in The Artists’ Rifles in October 1915 and was commissioned into the Manchester Regiment in June 1916. He had already distinguished himself in September 1918 by his courage on the Beaurevoir-Fonsommes line. Although the CWGC states that he was in the 5th Battalion, it seems that he was in action with the 2nd Battalion. Seven days after his death, the Armistice was signed, and on that very day Wilfred’s parents received the fateful telegram. Owen was a poet of repute, although during his lifetime only a few of his poems appeared in print. The Atheneum of December 1919, nominated Owen’s work Strange Meeting as the finest of the war. This entry was posted in Biography and tagged 1918, Browne, Manchester Regiment, Wilfred Owen by Christine. Bookmark the permalink.